FBI Photo shows a Glock Model 22, .40 S&W caliber. This will be replaced by new, striker-fired 9mm Luger pistols in both compact and full-size formats. The Federal Government loves to spend your tax dollars, and the FBI wants its share of the action. 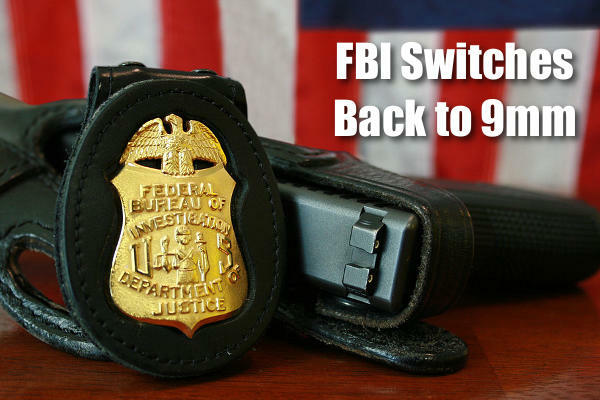 The Federal Bureau of Investigation recently issued a Request for Proposal (RFP) for the next generation of 9mm FBI pistols. At stake is $85,000,000 in Federal dollars for handguns, parts, and accessories. CLICK HERE to Download FBI RFP. Class I Compact Pistol: One (1) Class I Pistol with a barrel length of no less than 3.75” and no greater than 4.25”, minimum magazine capacity of 14 rounds, night sights, six (6) magazines, FBI approved gun lock. Firing pin/Striker fired only. Class II Full Size Pistol: One (1) Class II Pistol with a barrel length of no less than 4.26” and no greater than 5.20”, minimum magazine capacity of 16 rounds, night sights, six (6) magazines, FBI approved gun lock. Firing pin/Striker fired only. Why Change from .40 SW back to 9x19mm? Last time we checked the FBI had more than enough firepower. The FBI’s stated need for $85 million dollars worth of 9mm pistols* certainly raises questions, while re-igniting the “great caliber debate”. In May 1997, the FBI officially adopted the Glock .40 S&W pistol for general agent use. Now it is going back to the 9mm Luger (aka 9x19mm), which it had used in Sig P226/228 pistols from 1988 to 1997. Why make the change? Some people think advancements in propellants and 9mm bullets allow the smaller cartridge to rival the .40 SW for penetration and stopping power. Possibly the FBI learned that many of its agents couldn’t shoot the snappy, harder-recoiling .40 SW very well. So this change to a more user-friendly round may be all about compensating for lawmen who can’t shoot straight. LEOs miss between 70 – 80 percent of the shots fired during a shooting incident. 9mm Luger now offers select projectiles which are, under identical testing conditions, outperforming most of the premium line .40 S&W and .45 Auto projectiles tested by the FBI. 9mm Luger offers higher magazine capacities, less recoil, lower cost (both in ammunition and wear on the weapons) and higher functional reliability rates (in FBI weapons). The majority of FBI shooters are both FASTER in shot strings fired and more ACCURATE with shooting a 9mm Luger vs shooting a .40 S&W (in similar sized weapons). There is little to no noticeable difference in the wound tracks between premium line law Auto enforcement projectiles from 9mm Luger through the .45 Auto. Source: FBI Training Division, FBI Academy (Quantico, VA) Report quoted in LooseRounds.com. * In addition to the Compact and Full-Size duty pistols, the FBI plans to acquire training pistols and spare parts: “Class I Inert Training Pistol (a.k.a. Red Handle); Class I Man Marker Training Pistol (a.k.a. SIMUNITION); Class I & Class II Pistol Replacement Parts”. The $85,000,000 contract price would include these additional items. Share the post "FBI Plans to Spend $85 Million on New 9mm Pistols"
Can you guess what your next barrel will weigh? In many competition disciplines, “making weight” is a serious concern when putting together a new match rifle. A Light Varmint short-range Benchrest rifle cannot exceed 10.5 pounds including scope. An F-TR rifle is limited to 18 pounds, 2 oz. (8.25 kg) with bipod. Is there a reliable way to predict, in advance, how much a finished barrel will weigh? The answer is “yes”. PAC-NOR Barreling of Brookings, Oregon has created a handy, web-based Barrel Weight Calculator. Just log on to Pac-Nor’s website and the calculator is free to use. 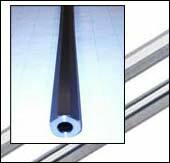 Pac-Nor’s Barrel Weight Calculator is pretty sophisticated, with separate data fields for Shank Diameter, Barrel Length, Bore Diameter — even length and number of flutes. Punch in your numbers, and the Barrel Weight Calculator then automatically generates the weight for 16 different “standard” contours. What about custom contours? Well the Pac-Nor Barrel Weight Calculator can handle those as well. The program allows input of eight different dimensional measurements taken along the barrel’s finished length, from breech to muzzle. You can use this “custom contour” feature when calculating the weight of another manufacturer’s barrel that doesn’t match any of Pac-Nor’s “standard” contours. 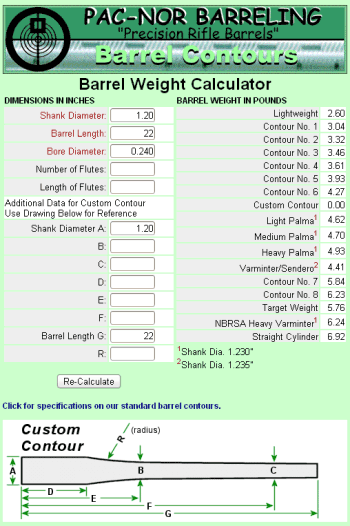 Share the post "Online Barrel Weight Calculator from Pac-Nor"